It is a service for finding information in a website by keywords and usually installed in headers, footers and sidebar areas. For website users, it is hard to find information in a website that has many pages. As the number of pages in the site increases, it will be hard to reach the information you are looking for, but by using search within the site, you will be able to find information easily. Site Search does not only improve the user-friendliness, but also brings benefits to webmasters. Since the user's search keywords are seem to be the reason for visiting the website, it gives hints for improving contents of the website to meet visitor needs. We are an official selling agent of "MARS FINDER" which is a Site Search developed and provided by MARS FLAG Corporation (Head office: Tokyo, Japan). MARS FINDER was born in 2006 and has been improved for many years based on user’s feedback. Easy installation and advanced features are highly evaluated by users, and it has been used by many companies, organizations, government offices, etc. MARS FINDER is the most popular site search service from leading companies in Japan. MARS FINDER is a cloud service, so it is easy to install and operation. The most unique feature of MARS FINDER is to show the search result with screen image of each pages. When the screen image hovered, the content in the page is enlarged. By checking the content before clicking, it contributes to reduce stress of clicking wrong page and improve the user experience. Of course, it supports multiple devices such as smartphones and tablets. You can try a demonstration in MARS FLAG’s website. It is possible to set a specific page to display in search result page such as "This page is also displayed for people searched with this keyword". Sometimes search keywords in Site Search differ from actual text contents in the website. This function leads visitors to right pages. It is a keyword suggestion feature in search window. During a visitor is typing a search keyword in search window, it suggests related keywords in real time. This function quickly guides visitors to right pages. It displays icon of content category for each page in search result page. It displays searched keyword ranking in search result pages. By this function, visitors can know popular search keywords in the website. 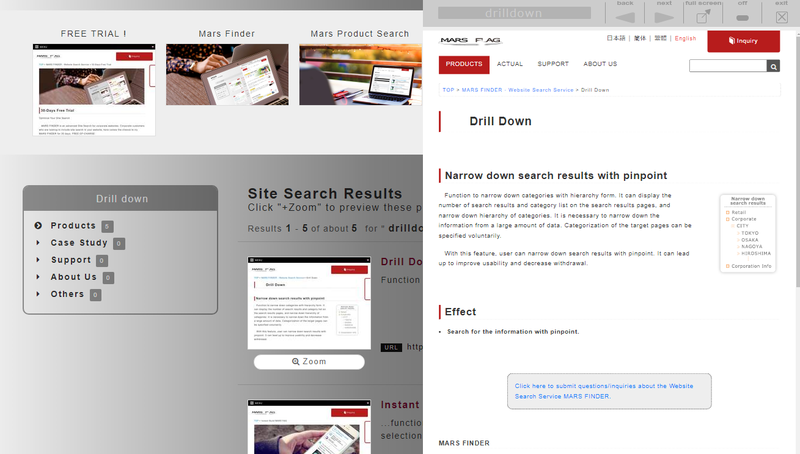 MARS QUALITY is a useful tool to check and control quality of a website. It crawl a website to find issues such as broken link, image missing automatically. By this function, a webmaster does not need to check issues in website manually anymore. A user of MARS FINDER can use a trial version of MARS QUALITY for free. Smooth replacement from "Google Site Search"
Google Site Search (GSS) is a Site Search service provided by Google. Google has officially announced that they will terminate this service on 31 March 2018. Current users of this service need to transfer to another service. MARS FINDER can be transferred from GSS easily in a short time. Please contact us from this Contact Form for further process. For any questions or concerns about the service, please do not hesitate to contact us too even you are under consideration. We will contact you to check followings. We will send you a quotation based on above information. We will do initial setup for MARS FINDER after the quotation accepted and signed. We will send login information for MARS FINDER’s administrative page to you. For any inquiries regarding MARS FINDER please contact us from here. ICOMM AVENU (MALAYSIA) CO., LTD. Subscribe to our newsletter to receive latest news on our products and services.